Kitty cats, to your left take a peek at Jimmy Choo’s classy Phyllis Espadrille Slide; in the right corner allow me to introduce you to Steve Madden’s glamorous Genisis. While the Madden marvels proffer a heel and platform that is ever so slightly higher than that found upon the pretty Phyllis, and are constructed out of synthetic materials as opposed to the true leather of the Jimmy gems; for just $89.95, in comparison to the $375.00 needed to scoop up the charming Choo’s, they allow the frugalista the chance to add a bit of high fashion fabulosity to her shoe collection – at a price that leaves behind enough spare change to take home all three sizzling shades (black patent, blush patent, and red patent)! Definitely the thrifty ones... I love Steve Madden! Always frugal here. Great find. So lovely! Glad you found this deal. I'm sure I wouldn't know what I was missing since I'll never buy a Jimmy Choo. Such a great shoe. Cool look-alike. I'm always out to get the cheaper one. Steve Madden does it for me. Love this wedge. Great find! This could seriously be my go to shoe this Spring. So cute! Man... if I could afford Jimmy I should would get them. Ooh lovely! My Amex would breathe a little easier with the Steve Maddens - they look awesome! i definitely like the choos here! normally id go for the bargain, but i think the maddens definitely look a bit cheaper (well, obviously they are LOL). have a great day! Oooooooh Jimmy Choo. Just because I've always wanted a pair. That's a good enough reason, right? I like the Steve Madden shoes. Great find! Steve Madden all the way!!! i would have to go for the choos, love them!! As much as I would love a pair of choos, I would totally go for the steve madden shoes. They are really good quality for the price. Espadrilles are so in right now! The plataform is lovely, but I really don't like the synthetic materials. Love these shoes, but I'm staying thrifty on this one. Bring on the Steve Madden's! I will score me some Choo's someday, though. I figure I'm worth it right? ... :). Those Steve Madden espadrilles are much more wonderful, even though my mom's name is Phyllis. Hope you have a great day, E.
They look similar but I'm wundering which feels better made for the most steps?? i'll go with the steve maddens for the price but they're both very nice. Perfect match as always! I love the Steve Maddens! Those Jimmy Choos are just too beautiful to pass up. I think I'll be splurging. The look alike is so similar. Wow, what great shoes--both pairs! I love Jimmy Choos, though, it's be hard to pass that up. Beautiful, they both look great! i'd love with an ankle strap...i think my feet would slip! Oh, good find! 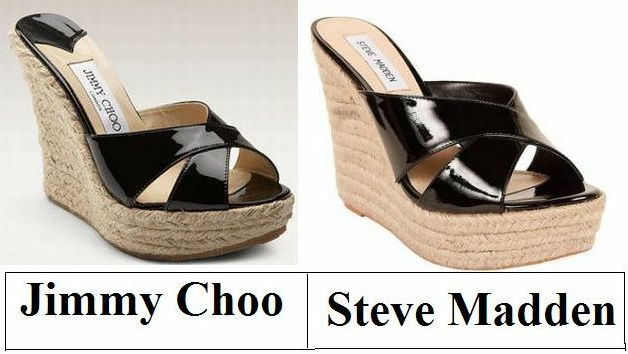 I'll go with Steve Madden! omg, are these back in style again?! i bought a similiar pair in white about six years ago and would be more than happy to break them out again! The Jimmy Choo ones are gorgeous. They look really pretty. love your looks for less. here i'd choose the steve madden ones. oooow, those are both nice. Jimmy Choo looks more delicate from the picture but it is important to try both on to know which one fits better. I love Steve Madden shoes! What a steal! 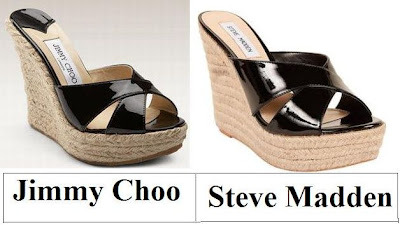 Though Jimmy Choo is a genius, I'd pick Steve in this case. The Choos are so much sleeker! Ok, well, it is subtle, but it's still a difference!